Critical Mindset: Lane Falkner talks about Trauma kits! OK, the podcast is here, Remember to subscribe to my podcast at iTunes and Stitcher. It was a phone call so the audio is not as clear as I would like but I think the content is great. Lane is a good guy that found a way to help at risk workers by creating a business he really believes in. Critical Mindset did not give me a dime to promote this, I did it because I think it’s a good idea. I am helping Lane out because this is something that will save lives. Saving lives should be on the mind of every tower site worker. Lane Falkner, ex-marine, tower climber, hard worker, is the co-founder of the Critical Mindset. This ex-marine discusses how he wanted to take the marine mindset of being prepared from the battlefield to the tower site and other civilian jobs that are high risk. He started Critical Mindset with the intention of getting the gear on site to keep people alive until the professionals can get there. He is working full-time and doing this ventures part-time, so you can imagine how hard this guy works! So, just so everyone knows, this guy has not paid me a dime, his brother reached out to me and mentioned what Lane is trying to do. I looked at his website and saw what he offered. After talking to him I realized he is a good guy trying to do some good in this business as other hazardous jobs as well. So in my conversation with Lane he goes over why he wanted to start this business where he could take the marine know how and help the “at-risk” workers. He came up with the trauma kits that are on his web page. This guy wants to make sure that everyone has everything they need to keep someone alive until the professionals get there, in other words if something bad happens that is beyond the first aid kit, like an emergency where the victim’s case would be considered trauma. In this case you need to do everything you can to keep that person alive until the professionals show up. When the EMTs show up, then they can take over but until then you need to be Johnny on the spot and keep them alive! There are so many risks on the tower, not just the fall but the all threads sticking out of the tower could be devastating even on a partial fall. Here is something that could help you save someone from a wound that could kill you. So if you know if this is something that your company should have, then say something. The other thing that I learned is that he has been providing them to the local police department because they didn’t have anything like this. I could not believe it but I guess many policemen don’t have this in their vehicle or with them. If you want to learn more about what they have then go to http://www.criticalmindset.com/about-us/ and read their mission statements then go to http://www.criticalmindset.com/shop/ to see what they offer. I concentrate mostly on the trauma kits because I see that as a need for the industry. To read some updates go to http://www.criticalmindset.com/mindset-daily/. I think it would be worth your while to go to their training page at http://www.criticalmindset.com/training-trauma/ to learn more. Here is an example of one of the videos, https://www.youtube.com/watch?v=AwcZaIHN0e0#t=58 to show you what they offer. If you’re interested in Warrior 4 Wireless go to http://warriors4wireless.com/ for more information. We thank you or your service. Here is a way for you to become a wireless worker. There are so many jobs in wireless right now, why not get started today? Put that mindset and skill to good use doing something you love. Let me know what’s wrong out there! Tell me your biggest problems and what you would like to hear more of. Wade4wireless@gmail.com or Facebook. Remember to subscribe to my podcast at iTunes and Stitcher. Spread the word! 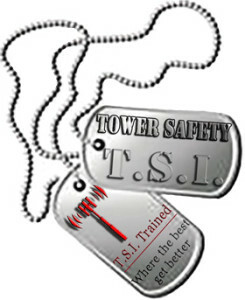 Thank you Tower Safety for being a sponsor! Where the best get better! Tower Safety! Offering OSHA 10, OSHA 30, Authorized Climber, Competent Climber, Train the Trainer, RF Awareness, and CPR/First Aid. If you can’t get to Phoenix, then they will come to you! Be smart, be safe, and pay attention! Follow your plan but don’t be afraid to adapt, improvise, and overcome your obstacles! Work with a plan! Start with the Introduction to Tower Climbing, then get The Field Worker’s Aid for Tower Site Work, then to get paid for the work take at the Scope of Work Training, and don’t forget the Tower Worker’s Logbook to log your high time and drive time and your project responsibilities, go to Wireless Deployment Products now! STOP! Show a member of the tower family you have love to give. Donate to Hubble Foundation today! Previous Harrison County: Cable snaps killing a climber at 240′!